Standard algorithms for the construction of iterated bootstrap confidence intervals are computationally very demanding, requiring nested levels of bootstrap resampling. We propose an alternative approach to constructing double bootstrap confidence intervals that involves replacing the inner level of resampling by an analytical approximation. This approximation is based on saddlepoint methods and a tail probability approximation of DiCiccio and Martin (1991). Our technique significantly reduces the computational expense of iterated bootstrap calculations. A formal algorithm for the construction of our approximate iterated bootstrap confidence intervals is presented, and some crucial practical issues arising in its implementation are discussed. Our procedure is illustrated in the case of constructing confidence intervals for ratios of means using both real and simulated data. We repeat an experiment of Schenker (1985) involving the construction of bootstrap confidence intervals for a variance and demonstrate that our technique makes feasible the construction of accurate bootstrap confidence intervals in that context. 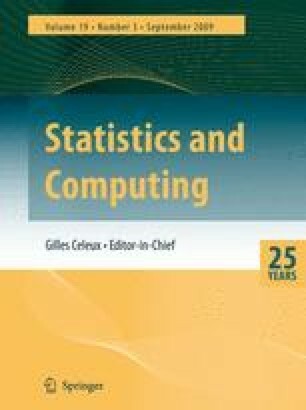 Finally, we investigate the use of our technique in a more complex setting, that of constructing confidence intervals for a correlation coefficient.